Male hypogonadism implies a decrease in the function of the male gonads, the testes, which is associated with either a decrease in the production of testosterone and sperms or a decrease in the effects of testosterone on other organs. Primary hypogonadism indicates primary testicular failure where the problem is thought to originate from the testes. It is also known as the primary testicular failure. Secondary hypogonadism, on the other hand, implies a problem in the hypothalamus or the pituitary gland is responsible for the testicular failure. Each type of hypogonadism may be present at birth (congenital) or acquired later in life through injury or infection of the gland involved in hormone secretion. Male hypogonadism is a common encounter, especially in men older than 45 years of age with an estimated prevalence of 39%. The prevalence of hypogonadism in men can differ from one study to another depending on their definition of low testosterone. When hypogonadism is defined as a total testosterone level of less than 325 ng/dL, the prevalence can range between 12 to 49% depending on the population’s age under study. Approximately half of the men who are in their eighties have hypogonadism. The incidence of new cases of male hypogonadism is also high and can be estimated to be approximately 5.6% in men aged 30 to 79 years. To understand the etiologies and the different pathophysiological mechanisms of hypogonadism, it is helpful to classify patients into primary and secondary hypogonadism. Klinefelter’s syndrome is associated with primary male hypogonadism. In Klinefelter’s syndrome, the male has more than one X chromosome in addition to his Y chromosome. A normal male karyotype should include only one X and one Y chromosome. An extra X chromosome affects the development of the testicles and is associated with a decreased production of testosterone and eventually male hypogonadism. Undescended testicles or cryptorchidism is also associated with an increased risk of infertility due to hypogonadism. The risk is highest when the child does not undergo a correction surgery early in childhood. Mumps orchitis is a viral infectious disease that involves different glands including the salivary glands, the pancreas, and the testicles. Patients with hemochromatosis have an increased iron overload, which is believed to be responsible for abnormal testicular function in a subset of patients and can be linked to decreased testosterone production and hypogonadism. Finally, patients with previous chemotherapy or radiotherapy treatment for any form of cancer can have an effect on sperm production and testosterone. When no cause can be identified and the patient is older than 80 years, it is very likely that hypogonadism is a normal aging process in this patient. Secondary hypogonadism may be traced from the deficient hormone which may be hypothalamus that produces gonadotropin-releasing hormone to stimulate the pituitary gland to release follicle stimulating hormone and luteinizing hormone which activate the testis to produce testosterone. Kallmann syndrome is associated with anosmia and the failure of the development of the hypothalamus. The hypothalamus produces a gonadotropin releasing hormone which acts on the pituitary to produce follicle stimulating hormone and luteinizing hormone, the latter responsible for inducing testosterone production. Failure of hypothalamic development would therefore lead to hypogonadism. Patients with pituitary tumors, microadenomas, or those with brain tumors who undergo radiotherapy, are at risk of pituitary gland dysfunction and abnormal release of follicle stimulating hormone and luteinizing hormone which can cause hypogonadism. Inflammatory diseases, such as sarcoidosis and tuberculosis, can involve either the hypothalamus or the pituitary and can cause dysfunction in the release of the different hormones described above and eventually hypogonadism. HIV/AIDS infection is associated with low levels of testosterone as it affects the hypothalamus-pituitary testicular axis. Use of opiate-based medication has also been associated with hypogonadism. Men with hypogonadism usually present with a history of infertility or because of absence or regression of secondary sexual characteristics such as facial hair growth, body hair growth, a change in the voice or libido. Patients can also present with muscle pain and reduced bone mass because testosterone is protective against osteoporosis. Patients who present with infertility can have oligospermia. Patients might also complain of erectile dysfunction, and a reduction in the ejaculate volume. Symptoms of depression reduced stamina, and feeling tired are also commonly described in these patients. Early diagnosis is important to prevent the patient from the problems associated with hypogonadism which include delayed puberty and osteoporosis due to low estrogen levels. Male hypogonadism can be diagnosed only when total serum testosterone levels fall below 300 ng/dL; hence, laboratory assessment of testosterone is needed. Testosterone testing should be performed early in the morning as the levels vary during the day and they should be highest during the morning. The next step would be to differentiate between primary and secondary hypogonadism. In primary hypogonadism, follicle stimulating hormone and luteinizing hormone levels are expected to be normal or elevated. In secondary hypogonadism, these two hormones would be decreased. The next step is to determine whether the cause of secondary hypogonadism is hypothalamic or pituitary related. Low follicle stimulating hormone and luteinizing hormone levels with an elevated gonadotropin releasing hormone indicate a pituitary problem. When all hormones including gonadotropin releasing hormone are reduced, a hypothalamic etiology needs to be excluded. Ultrasonography is helpful in patients with a suspected history of mumps orchitis or abnormal development of the testis. Patients with an absence of secondary sexual characteristics should undergo karyotype testing to exclude Klinefelter’s syndrome. Patients who are suspected to have secondary hypogonadism due to a pituitary disorder should undergo a brain magnetic resonance imaging study to evaluate the pituitary gland and the hypothalamus. Seminal analysis is also indicated to identify azoospermia, oligospermia and/or abnormal sperm quality in terms of motility, configuration or shape, which are all known to be common in men with hypogonadism and infertility. 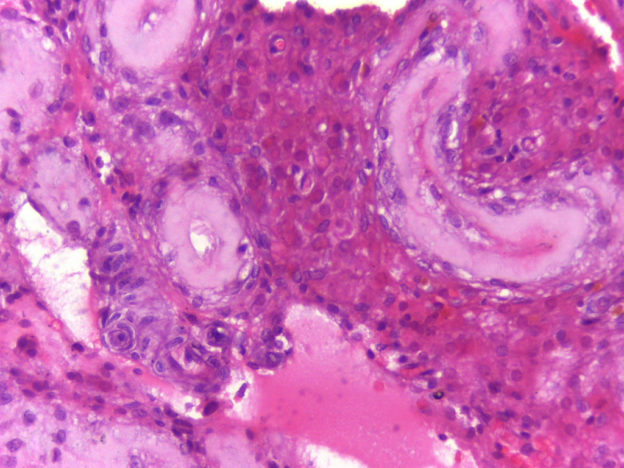 A testicular biopsy might be indicated in a few patients to confirm the abnormal testicular development, testicular inflammation or necrosis as what happens in mumps orchitis. At first, it is good to note that men who will undergo chemotherapy or radiotherapy for any form of cancer should be advised about the possible effects on future fertility, and should be provided the option to collect and store sperm samples if fertility is an issue. This, however, does not mean that men are unlikely to achieve fertility after finishing chemotherapy or radiotherapy, on the contrary, the majority of the patients can. The best and most straightforward treatment option of male hypogonadism is testosterone replacement therapy. Different forms of testosterone replacement therapy exist, and the choice of one option depends on the patient’s preference, the patient’s age and the expected goals. Transdermal patches of testosterone have the advantage of being more convenient than injection therapy, but can put the patient at an increased risk of skin irritation, allergies and contact dermatitis; therefore, this option should be used with caution in the elderly who are more likely to have skin irritation. Topical testosterone gels also can be used to restore normal testosterone levels and normal circadian rhythm of testosterone. They have also been associated with improved bone density and a lower risk of osteoporotic related fractures. Buccal tablets of testosterone result in sudden increases in blood levels of testosterone which resembles the endogenous pulsatile release mechanism. They are better tolerated than patches or gels. Similar to progesterone implantable pallets, testosterone pallets have also been developed and used with success in alleviating the symptoms of hypogonadism. The pallets can work for up to 6 months. Intramuscular injections of testosterone have been used with some success. They result in large fluctuations in blood levels of testosterone which can be associated with symptoms fluctuations. The advantages are less dosing as the injections are usually taken every four weeks and the injections are the most cost-effective option. Several visits to the doctor, injection site reactions, and abnormal testosterone fluctuations limit the use of this option. Oral testosterone tablets are also available. Patients with pituitary tumors should undergo microsurgery or endoscopic surgery to remove the pituitary adenoma. Hormonal replacement therapy of other hormones, such as growth hormone, prolactin, and gonadotropins, can also be needed in patients with secondary hypogonadism. Kumar P, Kumar N, Thakur DS, Patidar A. Male hypogonadism: Symptoms and treatment. J Adv Pharm Technol Res 2010; 1: 297–301.